RStudio is excited to announce the availability of RStudio Server Pro on the Google Cloud Platform. RStudio Server Pro GCP is identical to RStudio Server Pro, but with additional convenience for data scientists, including pre-installation of multiple versions of R, common systems libraries, and the BigQuery package for R.
RStudio Server Pro GCP adapts to your unique circumstances. 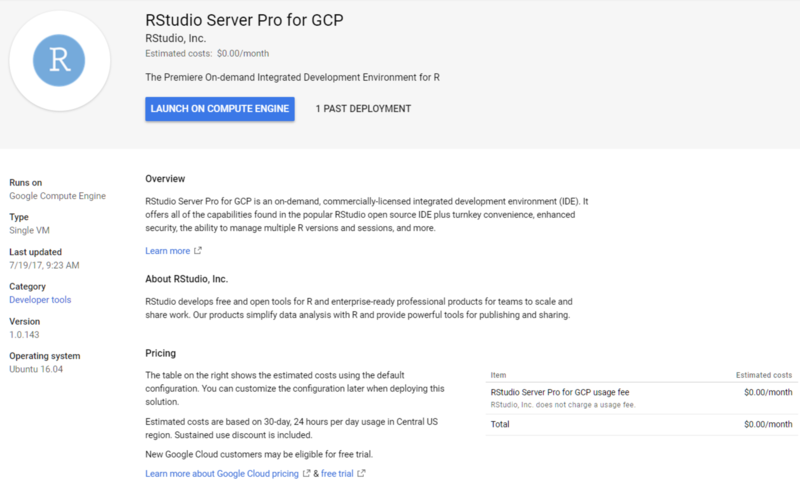 It allows you to choose different GCP computing instances for RStudio Server Pro no matter how large, whenever a project requires it (hourly pricing).